Location: West of the Aberdare National Park is Kenya's Rift Valley. In the east you have the highlands around Nyeri and Mount Kenya, the highest mountain in Kenya. From the Naivasha side, you can enter the Aberdare National Park using the Mutubio West Gate. On the east side there are several gates of which the Treetops and the Ark Gate are the most used. 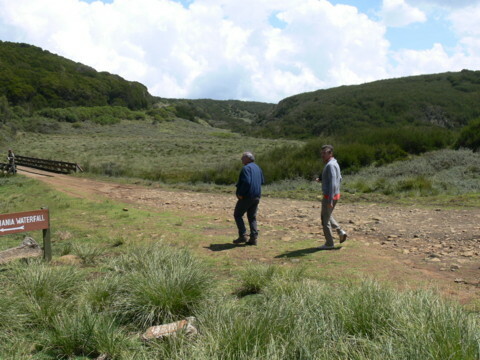 The highest point in the Aberdares is Olesatima at 4001 meter above sea level. Landscape: The lower part on the east side of the park is called The Salient. This area has dense tropical forest with a lot of big game and birds. In the higher moorlands there are three spectacular water falls: the Chania, Magura and Karura Falls. The moorlands have less game making it possible to step out of the safari vehicle and walk around. Before reaching the moorlands, you have to cross through bamboo forests. In the moorlands you can see the Giant Lobelia, a high altitude plant. In Kenya you'll only find Lobelias above the tree line on Mount Kenya and in the Aberdares. 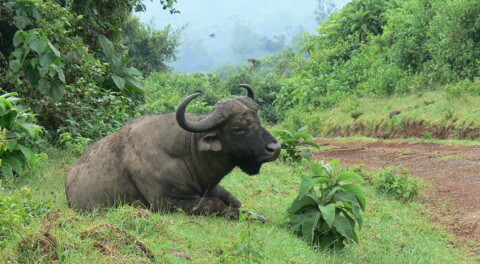 Less frequently seen in the park are: the Giant Forest Hog, Bongo (a high altitude antelope, found in the Aberdares and on Mount Kenya). To spot the black leopard, you have to be really lucky. The usual spotted morph of the leopard is found in the park and is much more common. Visitors: the two hotels built on stilts, Treetops and The Ark, are frequently visited but in the rest of the park, especially in the moorlands, you'll rarely meet with other visitors, although the vegetation and landscape in this park are unique and definitely worth a day trip. When princess Elibeth visited Treetops in 1952, she didn't realise she was going to leave the place as the queen of England, as her father, king George VI, passed away during the night. At that time, Treetops was exactly what the name says: a big hut built in a tree. Later this hut was destroyed by Mau Mau warriors but a bigger hotel, built on stilts, was erected in the same location. Treetops is built along some natural ponds, close to fence of the park at 1966 meter above sea level. Ontdek more often books The Ark (at 2300 m), which is deeper in the park. Activities: Walking in the moorlands, trout fishing, picnicking. Accommodation: in the park you can stay in The Ark or Treetops, two hotels built on stilts with several decks and underground bunkers from which you can come eye to eye with the game. The Kiandongoro Fishing Lodge (high in the moorlands), the Tusk Camp and the basic Sapper Hut are more budget friendly self-catering options. Good to know is: the Karuru Falls goes down in three steps, the first being 117 m, the second only 26 and the lowest one 130 meters. It is possible to cycle from the Kinangop Plateau to the Mutubio Gate at 3187 m. The climb goes over an ever winding tarmac road. Elevation gain is over 600 meter, so only for the fitter cyclist.